Thanks to everyone who turned up for the pre St. Patrick’s Day Blarney Tidy Towns clean up last weekend. 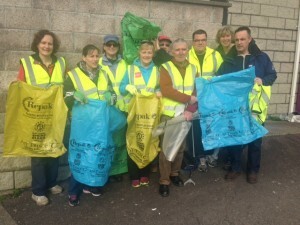 With one of the biggest turnouts for a long time, over 40 bags of litter were collected and this event also doubled as their first National Springclean 2015 outing. If any group or estate wishes to organise their own clean up please contact Kate at Blarney Tidy Towns on 087 2330398.